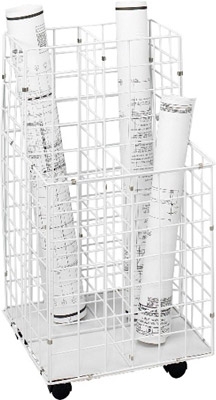 This Safco Wire Drawing Roll File is very handy when it comes to helping organize your drawings, maps, and blueprints. This Roll File can help save space on your desk and in your work area as a drawing organizer. Constructed of heavy-gauge steel rod with durable white plastic coating. Made to last and rolls easily to point of use on 2" all-surface casters. Dust guard on the bottom of the file keeps materials clean, while protecting rolled drawing edges. Easy to assemble in only minutes.